Caddis species actually provide as much incentive to learn their specifics as the mayflies do. There is just as much variety in their emergence and egg-laying behaviors, and as many patterns and techniques are needed to match them. Anglers are hampered only by the relative lack of information about caddisfly behavior and identification. In many species, the pupae become very active just before emergence and drift along the bottom of the river, sometimes for hours. The "deep sparkle pupa" patterns introduced by Gary LaFontaine in Caddisflies are the most popular of many imitations inspired by this behavior. It is a deep nymph fisherman's dream. Sometimes they drift similarly just below the surface for a long time before trying to break through. Shuck: The shed exoskeleton left over when an insect molts into its next stage or instar. Most often it describes the last nymphal or pupal skin exited during emergence into a winged adult.). The pupae of some species crawl out of the water on rocks, sticks, and such, so that the adults emerge high and dry. Some pupae rise to the surface and swim quickly across it to shore where they crawl out to emerge. Most caddis pupae are good swimmers, and they use their legs as paddles rather than wiggling their bodies to move. After emerging, caddisfly adults live for a long time compared to mayflies, in part because they are able to drink to avoid dehydration (mayfly adults cannot eat or drink). This flight period (Flight period: The span of time that the adults of an adult aquatic insect species are active and flying around, in between emergence and death. It may refer to the average adult lifespan of the individuals of that species, or to the total length of time for which at least some of them are active.) lasts anywhere from a few days to a few months, depending on the species, so mating adults may be seen on or over the water long after emergence is complete. 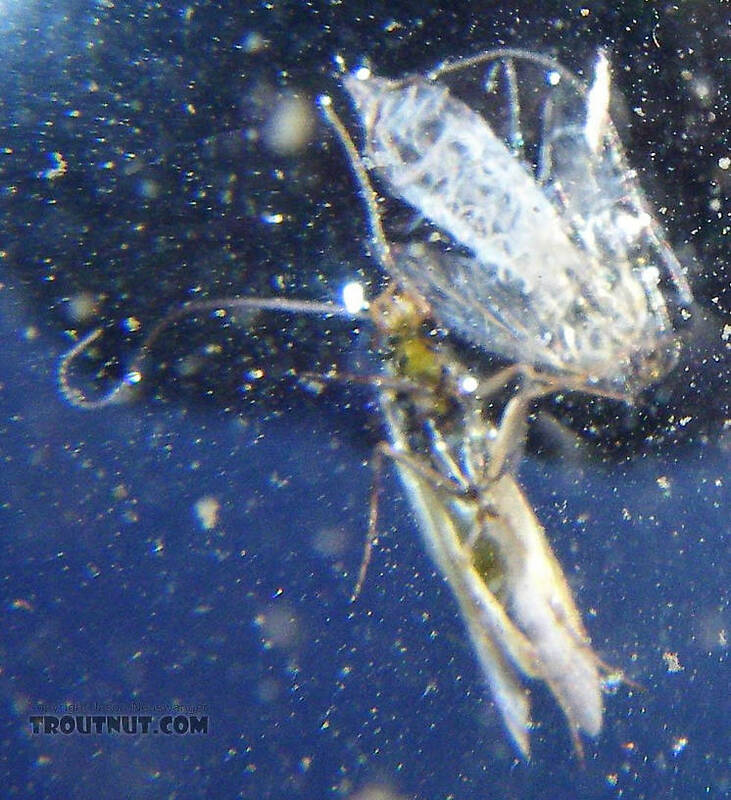 Many caddisfly females dive underwater to lay their eggs on the stream bottom. Some crawl down objects to do this but most swim right down through the water column. The latter are responsible for my fastest trout fishing action ever -- days when trout raced each other to attack my flies the moment they hit the water, cast after cast. Others lay their eggs on the surface in various ways. They may fly low over the water, periodically dipping their abdomens to lay eggs. Others land on the surface repeatedly, fussing and fluttering in enticing commotion. Less active species may fall spent (Spent: The wing position of many aquatic insects when they fall on the water after mating. The wings of both sides lay flat on the water. The word may be used to describe insects with their wings in that position, as well as the position itself.) to the surface with all four wings spread out. Others ride the water serenely while laying their eggs, and they are the easiest to match with the dead-drift (Dead-drift: The manner in which a fly drifts on the water when not moving by itself or by the influence of a line. Trout often prefer dead-drifting prey and imitating the dead-drift in tricky currents is a major challenge of fly fishing.) techniques of mayfly fishermen. Some egg-laying methods keep the adult females safe from trout altogether. They may drop their eggs into the water from overhanging plants, or lay their eggs on the vegetation itself. That way the eggs don't enter the river until the next rain--an excellent drought survival strategy. Most caddisfly larvae live in cases they build out of sand, rock, twigs, leaf pieces, and any other kind of underwater debris. Some even generate their own cases out of silk. There is tremendous variation in case style and also in the way the larvae manage their cases: whether they replace it as they grow or renovate their old one, and whether they carry it around or fix it to an object. Trout love to eat these larvae, case and all. Other common caddis larvae build nets instead of cases. These are not residences but hunting traps, like tiny spider webs, designed to capture plankton and smaller aquatic insects the larvae eat. One larva may build more than one net and roam freely around the rocks and logs tending to each and ingesting the catch. The net-spinning families, in order of abundance, are Hydropsychidae, Philopotamidae, and Arctopsychidae. One large and primitive family of caddisflies, Rhyacophilidae, needs neither cases nor nets. Most of its species are predators who stalk through rocky riffles killing other insect larvae and nymphs. All of these types are especially prone to behavioral drift (Behavioral drift: The nymphs and larvae of many aquatic insects sometimes release their grip on the bottom and drift downstream for a while with synchronized timing. This phenomenon increases their vulnerability to trout just like emergence, but it is invisible to the angler above the surface. In many species it occurs daily, most often just after dusk or just before dawn. ), making them an important food source year-round for the trout in most rivers. When caddis larvae are full-grown, they seek hiding places to pupate, either in their cases or in special cocoons. They are considered to be pupae throughout the radical reformation from grub-like larva into intricate winged adult. Some of the larva's body mass is consumed as energy for the development of the pupa, so the pupae and adults both have bodies one to three hook sizes smaller than their mature larvae. 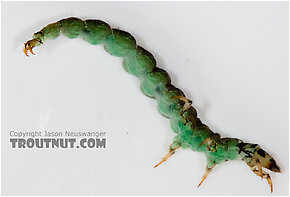 When pupation is complete, the insect which begins the emergence sequence is called a pharate adult (Pharate adult: Caddisflies are considered to be pupae during their transformation from larva into adult. This transformation is complete before they're ready to emerge. The emerging insect we imitate with the "pupa" patterns we tie is technically called a pharate adult. It is a fully-formed adult caddisfly with one extra layer of exoskeleton surrounding it and restricting its wings.). It is no longer technically a pupa in the language of entomologists, but because anglers universally recognize the term "pupa" I use that convenional misnomer throughout this site. Sometimes individuals within the same fall-emerging species mature at different rates. In some species, mature larvae compensate for this by entering an inactive phase called diapause (Diapause: A state of complete dormancy deeper even than hibernation. While in diapause, an organism does not move around, eat, or even grow. Some caddisfly larvae enter diapause for a few weeks to several months. Some species of microscopic zooplankton can enter diapause for several hundred years.) prior to pupation. Cool fall weather triggers the end of this phase for every individual within a few short weeks, synchronizing emergences that would otherwise be spread over several months. 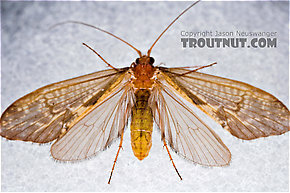 This boosts the quality of autumn caddisfly hatches like the giant western genus Dicosmoecus. They are often seen over the water when they are doing nothing more than flying around. More often it's the caddisflies you don't see that are important, the females diving underwater to lay their eggs or the pupae drifting below the surface preparing to emerge. While the Grannom Caddis and Apple Caddis are both from the Brachycentrus Genus, they are seperate "species". I believe much confusion is caused by some who refer to both as the "Grannom". 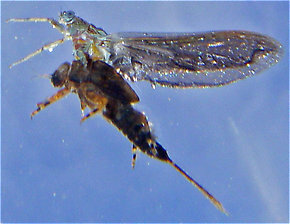 Grannom (species: numerosus) is not the same color, nor does it hatch the same as the Apply Caddis (speicies: applachia). Pupa of the Grannom have a dirty olive, to dark olive body, with brown wing pads, and a brown shuck.They often hatch mid morning. The Apple Caddis Pupa is a light brighter olive, and a amber wing pad and amber to ginger shuck. Apple Caddis tend to hatch later in the afternoon. While size might be the same, the coloration of the adults have a completely different look. Apple Caddis adults have a very light colored wing, and a light (apple green body color). Grannom adults have a brownish wing with a body of dark olive, mixed with brown to black coloration. I have further noticed that the Grannom seem to hatch over much of the stream while Apple Caddis seem to hatch closer to shore. I'm just trying to clear up the problem of some calling both the Grannom, which leads to much confusion. I believe this is the species found in sometimes very large numbers on the Lower Sacramento River in the Redding area. Ten years ago it was present in such large numbers that fishing a fly on the bottom resulted in frequently hooking one of these caddis still in its case. Along with other aquatic insects their numbers have declined to a fraction of once seen. I don't believe the egg Sac dropped by the females to be olive , instread I have seen it to be a bright green. The females seem to oviposit close to the edge of flowing water and not midstream. Discovered one of these guys or (gals?) back on March 20 of this year up in Waterton Canyon. He was so chunky I first thought it was a small hellgrammite (I grew up in Virginia, where the hellgrammite was the bug of choice in most smallmouth rivers). This particular one measured about half an inch and had a bright green tail/foot segment. I'm curious if you guys have a favorite immitation? Thanks! Hi All! I was reading through the site and I happened upon the Grannom (Apple) Caddis page, which made me wonder. Here in PA it is called The Mother's Day Caddis, I believe. Adults, which trout rarely feed on, are imitated with black or peacock herl bodies. The pupa, or emrgers I guess, we imitate with a wet fly. It has a peacock herl body and brown hackle for the legs, etc. in a size 14. Is this the same Grannon as the apple Grannom? Just curious! I still get confused by these caddis and I'm trying to narrow down a list of caddis patterns and colors to cover the largest percentage of the hatches throughout the year. There are 3717 more topics. 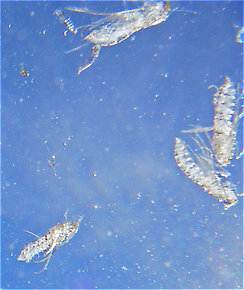 Behavioral drift: The nymphs and larvae of many aquatic insects sometimes release their grip on the bottom and drift downstream for a while with synchronized timing. This phenomenon increases their vulnerability to trout just like emergence, but it is invisible to the angler above the surface. In many species it occurs daily, most often just after dusk or just before dawn. 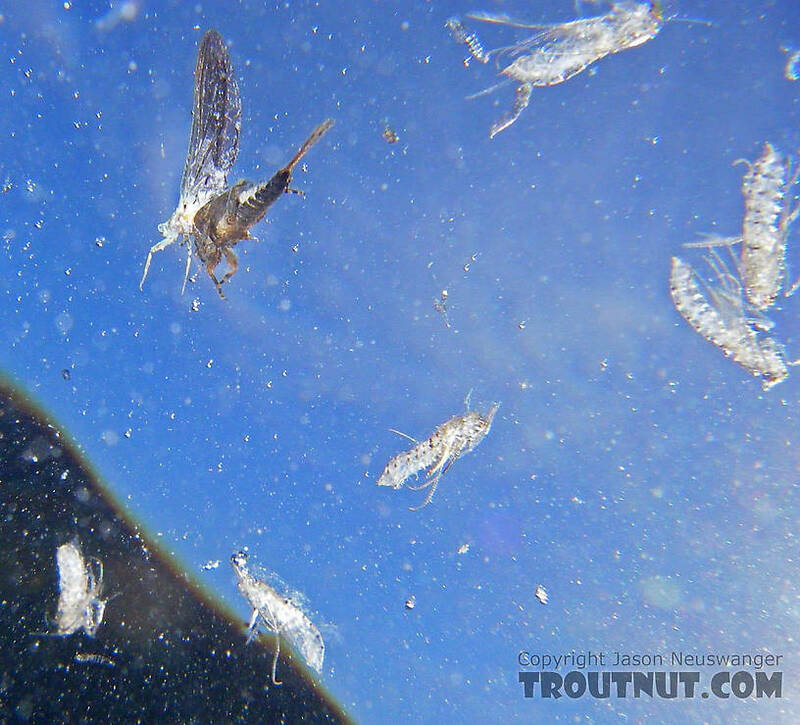 Flight period: The span of time that the adults of an adult aquatic insect species are active and flying around, in between emergence and death. It may refer to the average adult lifespan of the individuals of that species, or to the total length of time for which at least some of them are active.